The overnight safari is simply a mixing between the morning and afternoon safaris in which you can attend the sun down and sun rise and also camp for the whole night in the desert on nature bed. Meet your guide at hotel and directly drive to the camp where you will be welcomed with warm Arabian tea before getting ready for the BBQ dinner on magical Arabian melodies and belly dance show in a totally oriental atmosphere. After dinner and belly show, tents will be ready to receive you for the new sleeping experience in fresh air and under pure dark sky. You won't need to set alarm as you will wake up on your own by the first sun rays of sunrise, attend sunrise and take photos of the new day within unrepeated wonderful moments. Then it is time to breakfast which you will enjoy for last before leaving the nice place saving wonderful memories about such a new experience. By the end of tour, you will be transferred to hotel. - Pick-up from Dubai at 16.00 pm (time can vary according to the season). - Dune Bashing in 4x4. - Stop in the dunes for Sunset and Falcon Show (during winter month). - Reach private set-up in the middle of the desert. - Enjoy a small camel ride, Arabic Coffee, Tea and Dates. - Laze around on our comfortable couchons and enjoy a sheesha. 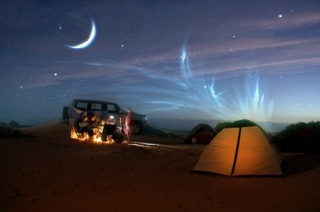 - Overnight in the desert (sleeping bags, blankets and couchons are provided). - After sunrise pick up in 4x4 for short drive to the Al Shamsi Bedouin Camp. - Light breakfast at the camp and possibility to take shower.